Vol. 3 Ana our student ambassador: How to apply studying abroad as a Erasmus student? Today, I´m going to talk you about the process to apply for study abroad. As I said in my last post, before starting International Trade degree I was thinking in different countries to study abroad, and I have had some ideas, but then I needed to verify the possibilities which my home University offered me. On October 2017, we had the first meeting to know the available countries to study abroad. 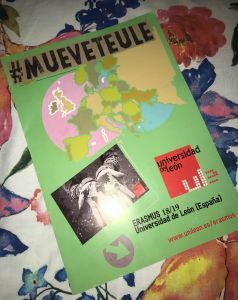 All the students in my University can study abroad, so my University has many partner Universities, and also the student can open new agreement with different Universities which haven´t got an agreement for the moment with our University. At the end of October I had in mind four countries: Finland, Germany, France, and Belgium, so I made an appointment with the coordinator in charge of each country to know the subjects which I could course in each University. These coordinators gave me detail information about each country, and although all this four countries caught my attention, Finland was the first in my mind due to the educative system, and the big difference between both countries. After that, there was a public selection in which all the students from my faculty were present, and we were required to choosing a foreign University according with our grades. I had the opportunity to choose my favourite destination, so I did it, I chose Seinäjoki (Finland) to study abroad during one year (from September 2018 to May 2019). The next step was to be in contact with Seinäjoki University of Applied Sciences to choose the subjects which I would study, fill all the required documents, and planning all the details to achieve a perfect stay here. This step was leading by my Coordinator in my home University. Meet us in our blogsite soon!